Rev. 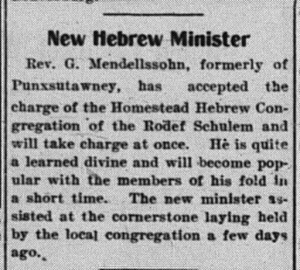 G. Mendellssohn, formerly of Punxsutawney, has accepted the charge of the Homestead Hebrew Congregation of the Rodef Schulem and will take charge at once. He is quite a learned divine and will become popular with the members of his fold in a short time. 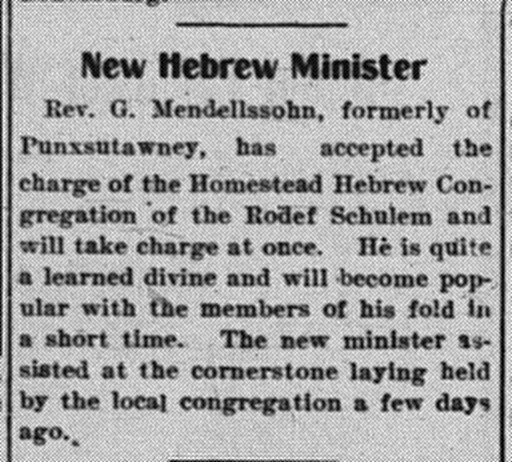 The new minister assisted at the cornerstone laying held by the local congregation a few days ago. 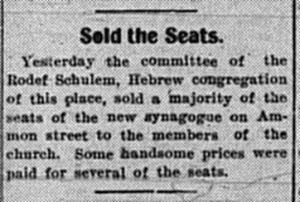 Yesterday the committee of the Rodef Schulem, Hebrew congregation of this place, sold a majoriy of the seats of the new synagogue on Ammon street to the members of the church. 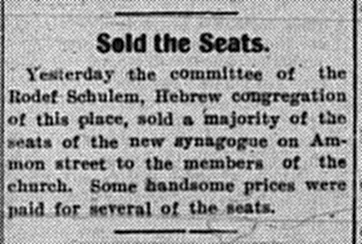 Some handsome prices were paid for several of the seats. In the New Hebrew Synagogue on Ammon Street.